It's that holly jolly time of the year again when you most likely get bitten by a bug ... the Humbug or more hopefully the Christmas Merry Bug! And yes, there seems to be some in between states of mind as well. Or you might flip from one to the other one day to the next. That's OK, just try to take a little time to breath in the beauty of the season and shake off the stress that sometimes comes with it. 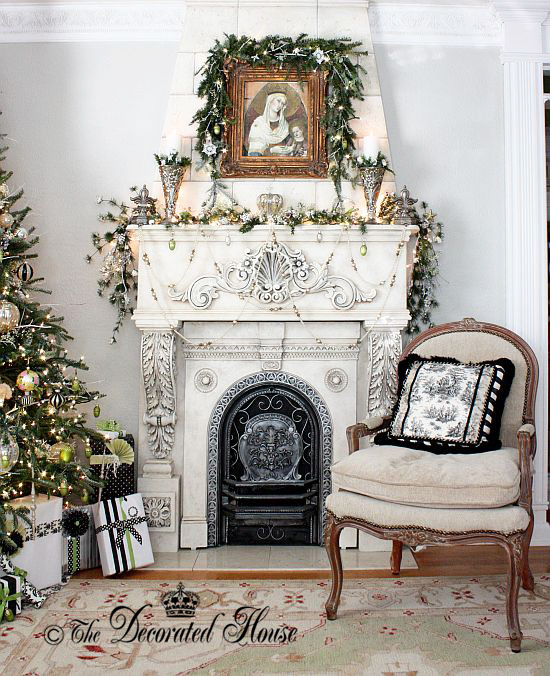 Black and white at Christmas? It might seem like an odd color combo for Christmas decorating. But we have been using it for a while, and I still love it! I think it started for us several years ago when we got a Bambi, Radko ornament set with Flower and Thumper being the cutest of the lot. Flower of course is black and white/silver so that one has been displayed the most over the years. But it was the star that came later that really moved the color scheme to black and white. Then a couple of years after Flower came to Christmas, I found a pretty MacKenzie Childs star to add to the decorating mix. A few more, including one more star, came along in the next few Christmases. After a couple of tree crashes that destroyed a lot of the overpriced ornaments, I vowed not to get anymore. Out of all those glass ornaments, the stars are the only ones on the tree every year and I still love them! The amount of lime green varies a bit year to year sometime a little more and sometimes a little less. 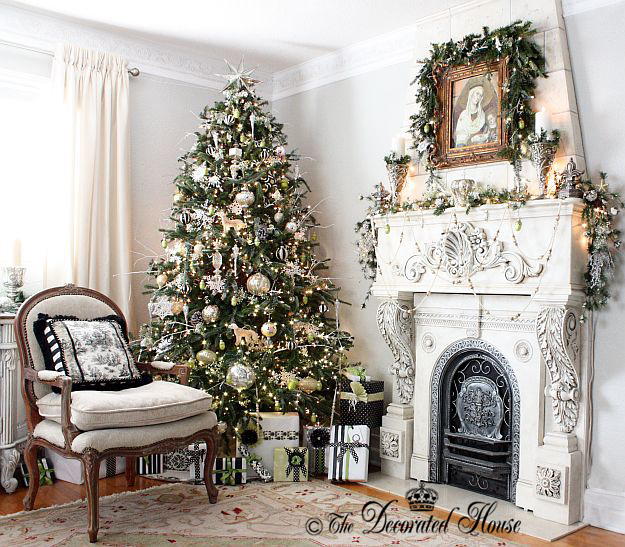 Still the Christmas decorating for me is white and silver with touches of black and remains my favorite combination with a touch of lime green. Amazing to me, the presents are getting wrapped a bit early this year! Between procrastinating and trying to hide the gifts from my daughter, over the years I always seemed to be playing catch in on Christmas Eve, often everyone was in bed. This year I have a very good start on the packages which are going to be wrapped in white and silver, with black and lime green accents. Thank you for stopping by and your sweet note. Beautiful, Donna! I love the black and white theme. I like how you are wrapping your packages to coordinate. I want to get started wrapping mine this weekend. Oh, I do remember how you too love black and white! Thanks for coming by. Donna, your home is just so very beautiful, elegant and classy. I have enjoyed looking at your photos and also note how perfectly wrapped the presents are. LOVE that French chair, too.